Barack Obama: "Friends, family and the entire nation are grieving"
US President Barack Obama has said the "entire nation" is grieving after a shooting that killed 13 people at a Texas army base. He said he had ordered all flags at the White House and other Federal buildings to be flown at half mast until Veterans Day on 11 November. Meanwhile hundreds of people held a candle-lit vigil at the Fort Hood base. Major Nidal Malik Hasan, 39, a US-born Muslim and army psychiatrist, opened fire at Fort Hood on Thursday. He was due to be deployed soon to Afghanistan, a military official said. Family members said Mr Hasan was strongly opposed to the deployment and had wanted to leave the army. 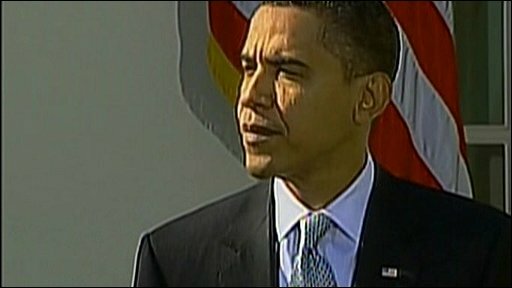 Mr Obama cautioned against "jumping to conclusions" and said the motives for the shooting were being investigated. Military officers have long expressed concern over the state of psychiatric medicine in the US armed forces. Officers say privately that thousands of young men and women are returning from Afghanistan and Iraq with psychological problems. Post-traumatic stress disorder can result in debilitating symptoms, ranging from anxiety to depression. Earlier this year, the Pentagon committed $50m to a study designed to investigate why suicide rates in the military are rising. Officers are overwhelmed by the number of soldiers requiring treatment and they say there's been pressure to retain psychiatrists inside the military system. It is quite possible that if and when Maj Hasan goes on trial for these shootings, military medicine will be on trial, too. "What we do know is that their families, friends and an entire nation are grieving right now for the valiant men and women who came under attack yesterday," he said on Friday. He added that the order for flags on federal buildings to fly at half mast was a "modest tribute to those who lost their lives". Later Japanese media reported that Mr Obama had asked to postpone his visit to Japan next Thursday by a day so that he could attend a memorial service for those killed. The chief of staff of the US Army - Gen George Casey - said the attack had been a "kick in the gut" for the entire army. On Friday, US soldiers and civilian residents at Fort Hood attended a candle-lit vigil in honour of the victims of the shootings, many crying and bowing their heads. "Remember to keep breathing ... keep going," Chaplain Douglas Carver told the crowd, quoted by AP news agency. The attack began at about 1330 (1930 GMT) on Thursday at a personnel and medical centre at Fort Hood - the largest US military base in the world, home to about 40,000 troops. The commander of the base, Lt Gen Robert Cone, told NBC News that, according to eyewitnesses, Mr Hasan had shouted the Arabic phrase "Allahu Akbar!" [God is great] before opening fire. Deputy commander at Fort Hood, Col John Rossi, later said that more than 100 rounds were fired during the attack. Col Rossi also confirmed earlier reports that the two handguns carried by Maj Hasan were not military arms, but "privately owned weapons". He said that the suspect - who had been on a ventilator in a civilian hospital - was transferred on Friday by helicopter to the Brooke Army Medical Center in San Antonio, Texas. Maj Hasan was shot four times during the attack and is currently being treated in hospital under armed guard. The policewoman who shot him first - named as Kimberly Munley, 34 - was among those wounded. A picture is beginning to emerge of the suspect, a psychiatrist who was transferred to the Texas base in July. Reports suggested that he had been increasingly unhappy in the military and that his work at his previous post - Walter Reed Army Medical Center in Washington DC - had been the subject of concern. His cousin told US media that Maj Hasan had been opposed to an imminent deployment overseas, describing it as his "worst nightmare". Asif Qadri, who runs a clinic at a Muslim community centre where Maj Hasan prayed in Silver Spring, Maryland, told the BBC: "He seemed to be quite a gentleman... When I saw this news last night, it was unbelievable to me that this was the same person." The imam of the mosque, Mohamed Abdullahi, said: "I never assumed that someone who took care of the mentally ill would himself be having problems." A fellow Fort Hood soldier told the BBC that the incident could put pressure on Muslim American soldiers. "It kind of puts a negative light on them and makes people distrust them because everybody is going to look at them [and think]: 'Well, you're probably going to pull something like this'," the soldier said. "And it's a sad fact that that will happen." 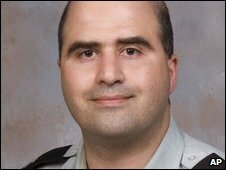 The New York Times said the FBI had been investigating internet postings by a man called Nidal Hasan that appeared to back suicide bombings - but said it was not clear whether it was the suspect. Gen Cone said a graduation ceremony for a group of soldiers was taking place nearby at the time of the shooting. "Thanks to the quick reaction of several soldiers, they were able to close off the doors to that auditorium where there were some 600 people inside," he said. "As horrible as this was, I think it could have been much worse." In an e-mail to the BBC, a US soldier stationed at the base described the venue as a large, open room where hundreds of soldiers were queuing up to get their pre-deployment checklists signed off.